Carlson Capital Management’s investment philosophy is based upon academic research and the belief that markets are efficient. It is designed to remove emotion, mitigate risk, capture global market returns and drive the success of your wealth management plan. The ten key principles detailed inside are foundational to our approach as we work to help our clients use their wealth as a tool to accomplish what is important to them. The market’s pricing power works against mutual fund managers who try to outsmart other participants through stock picking or market timing. As evidence, only 17% of US equity mutual funds have survived and outperformed their benchmarks over the past 15 years. The financial markets have rewarded long-term investors. People expect a positive return on the capital they supply and, historically, the equity and bond markets have provided growth of wealth that has more than offset inflation. Academic research has identified these equity and fixed income dimensions, which point to differences in expected returns. 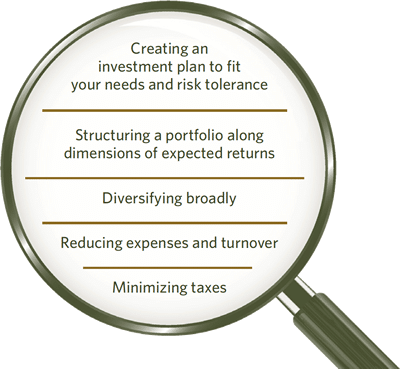 Investors can pursue higher expected returns by structuring their portfolio around these dimensions. Exhibit 3: At the end of each year, funds are sorted within their category based on their five-year total return. Funds in the top quartile (25%) of returns are evaluated again in the following year based on one-year performance in order to determine the percentage of funds that maintained a top-quartile ranking. The analysis is repeated each year from 2007–2016. 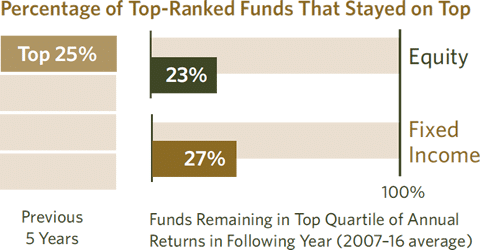 The chart shows average persistence of topquartile funds during the 10-year period. Exhibit 7: In US dollars. US Large Cap is the S&P 500 Index. US Large Cap Value is the Russell 1000 Value Index. US Small Cap is the Russell 2000 Index. US Small Cap Value is the Russell 2000 Value Index. US Real Estate is the Dow Jones US Select REIT Index. International Large Cap Value is the MSCI World ex USA Value Index (net dividends). International Small Cap Value is the MSCI World ex USA Small Cap Value Index (net dividends). Emerging Markets is the MSCI Emerging Markets Index (net dividends). Five-Year US Government Fixed is the Bloomberg Barclays US TIPS Index 1–5 Years. The S&P data is provided by Standard & Poor’s Index Services Group. Frank Russell Company is the source and owner of the trademarks, service marks, and copyrights related to the Russell Indexes. Dow Jones data provided by Dow Jones Indices. MSCI data © MSCI 2017, all rights reserved. Bloomberg Barclays data provided by Bloomberg. Chart is for illustrative purposes only. SOURCE: Dimensional Fund Advisors LP. Dimensional Fund Advisors LP is an investment advisor registered with the Securities and Exchange Commission.